I'm contemplating building a wood exterior door using a multipoint lockset, most likely in a Euro style overlay door but that's not completely decided yet. There are obvious advantages but there are likely some disadvantages, too. So I'm seeking info. from those of you who have used multipoint locksets with respect to brand or brands, how difficult the installation was, and if you had any follow-up issues with it. Thanks. I agree, the Euro groove multi-lock systems certainly have some advantages over many traditional designs, including inherited multi-strike/latch security and multiple compress seal opportunities, which can enable additional thermal and sound comforts in your product designs and offerings. Euro groove standard hardware systems are readily available in North America through various supply chains. Some of these hardware manufacturers are Roto, AGB, GU, and Winkhaus. Hardware companies should be able to provide you a specific (or a packaged) build of material to your door designs and product dimensions. Hardware installation template (plastic jig) may also be available. You may even be able to get gaskets from the same supplier. For shaper insert tooling, here is our reference video here: https://rangate.com/products/multi-point-euro-groove-cutter. With the standard Euro groove dimension and a center screw locating line, the milled groove makes the hardware installation easier. There is also the Alpine Workshops. Two weeks ago, there was the door workshop on making North American Door, Euro Door, and Lift and Slide Doors. We just finished a workshop yesterday on Euro Door and Windows. 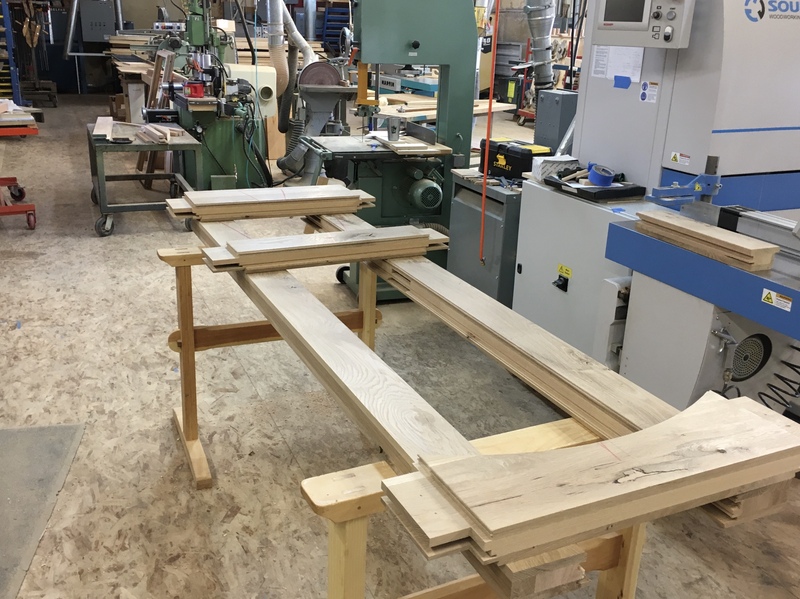 The schedule is posted here: https://alpineworkshops.com/contact/schedule.html. The workshop could be a good source of knowledge, skills, product investigations if required. I hope this is somewhat helpful to your exploration. Thanks for your thoughtful response, Chris. Very much appreciated. Surely someone here has used multipoint? We have used Multipoints for many years. KFV, AGB, Hoppe, GU, Winkhaus and AGB are the brands I have used. KFV is considered the best and has some of the latest designs but most of their top gear is not available here. I use mostly AGB because I can get all the parts I need for Euro rebated doors from FFI. My feeling is I like them for Euro style rebated doors but not so much for North American style slab doors. They are good on slab French doors though, as you can have handle locking on the slave door. Most of the European mfgs that have brought these into the US market modified 4mm AG locks to work with North American type doors. For example, strikes that can be routed into a jamb face for the latch, deadbolt and hook strikes. This was frustrating for me because none of these type strikes work on rebated doors. I prefer cam and mushroom locking points because they pull the door down tight against the gaskets. Hook strikes not so much except for some of the latest designs coming from Europe. The cam locking points are nice on French or double entrance doors as you can go around the top and bottom corners of both doors for locking points instead of using shoot bolts on the slave door. This only works on Euro doors. All that said you might check with some of the sellers of multipoints to see what is available. I have not searched out any thing new from other suppliers for a while. You are limited to lever handles, no thumblatches. Not many finishes are available on the lock parts and strikes. It’s a lot of routing for the strikers if you are not a CNC shop. The finishes on the strikes used for rebated doors is terrible even though the strikes function well. It is possible to plate them but drives up the cost and time frame. Things are getting better though. Rocky Mountain and some of the other high end mfgs now offer a wide selection of trim sets for these and I am finding it easier to source profile cylinders for my thick doors. They are more secure with all the locking points especially for Dade county type testing. They did have some issues in the UK a few years ago with people breaking in just by cracking the profile cylinder. I think the newer cylinders are now secure against this. There is more, that’s all I can think of now. 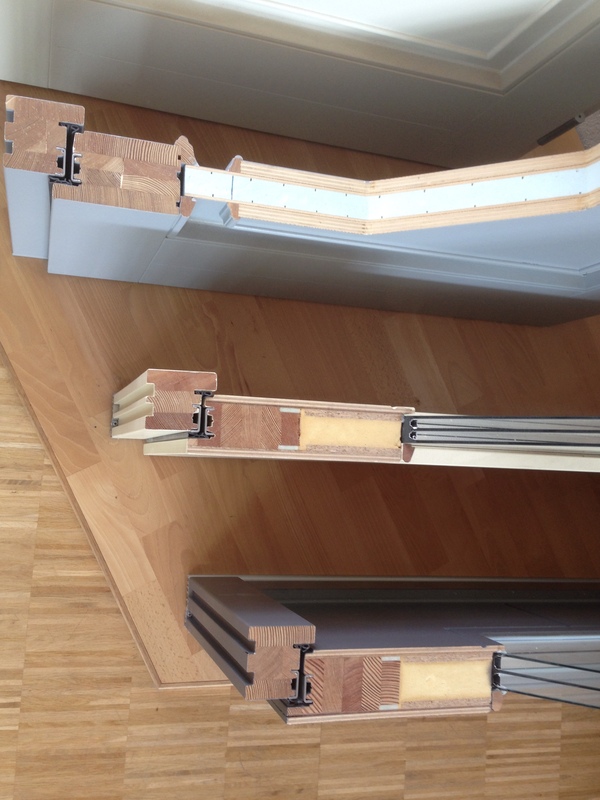 Pictures are AGB multipoints in a fold slide Euro door. Thanks very much Joe; I was hoping you would share some of your insights. I have looked at FFI based on input from you several months ago, and they look to have nearly all the components needed to build a Euro style door - multipoint, gasketing, hinges. Have you found any cases where a lock stile has warped enough to make closing/locking the door difficult? Not one of your doors, of course, but have you seen if on others? Most of the doors I've looked at in Europe are composite construction and probably less likely to warp than typical solid members used here. Yeah, no CNC in my shop so the extra mortising is going to take time. I do have access to one though, so that's a possibility I could explore. No problems with warping. 68 -78mm thick 3 layer stiles stay straight. Some problems early on with strike location errors. Thanks Joe. That's thicker than I would want to go. I'm thinking 2-1/4". How would you feel about multipoint at that thickness? And are your stiles solid wood or composite construction? 21/4” works fine for a Euro door but I would not go less than that. At that thickness the right size profile cylinder will be easy to source. I used to have a hard time getting correct size cylinders for my 68 and 78 thick doors but Rocky Mountain will do those and even Emtek has a stock one that fits my 68 thickness. It gets difficult in the thick doors because the profile cylinder is not centered in the door. We usually are doing stile and rail doors and use the same 3 layer solid construction as our windows. The Europeans do not favor stile and rail construction for entrance doors and have a lot of unique core material at their disposal to make built up doors. Most every shop even the smallest has a hot press also. 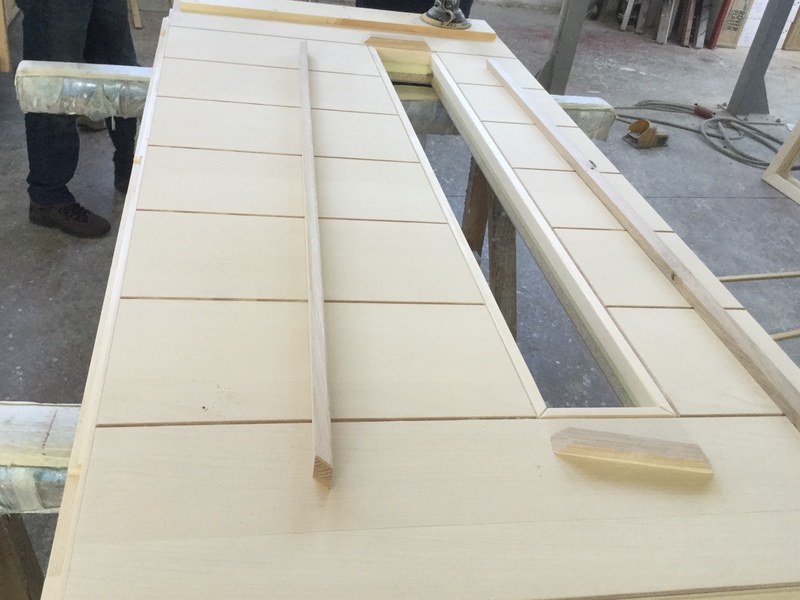 Here are some pictures from European shops showing core samples, door in progress and a finished door. Notice the door frame is the standard 3 layer solid construction. Thanks once again, Joe. I appreciate you taking the time and effort to not only answer my questions but also to post pictures of what you are talking about. Some of those stiles look like those made by Holz Hogger. I scratched my head for a long time trying to understand how those thin pieces of aluminum would help keep the stiles stable. 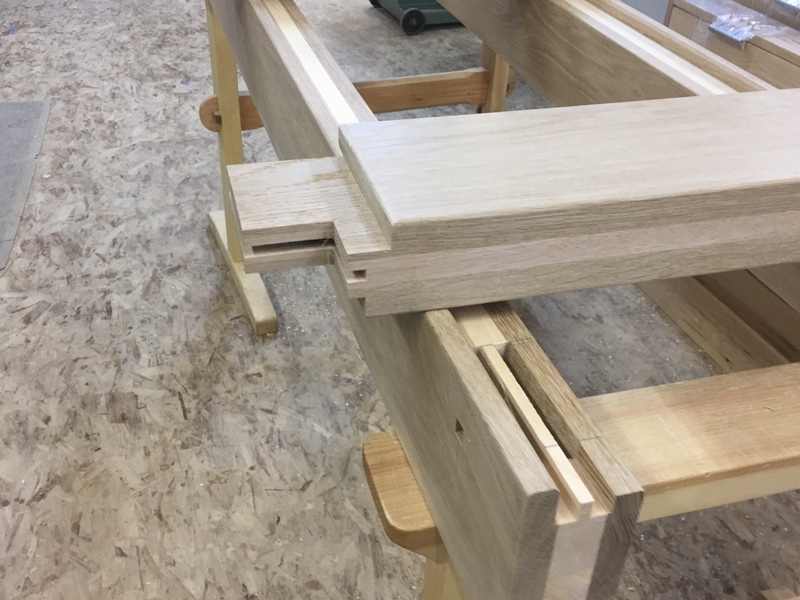 It finally occurred to me that they must act like a torsion box - if a stile tries to bow the outside layer of aluminum will go in tension and help resist any movement. Seems to make sense from that perspective though I have no clue if it actually works in practice. In any case, I doubt I will be trying that idea any time soon. I'm hoping the laminated construction combined with a multipoint lock will keep everything straight and true. There are several companies in Europe making these cores. I talked to a couple at length this year at Fenester Bau. I was more interested in how the thick veneers they apply to slab doors hold up. 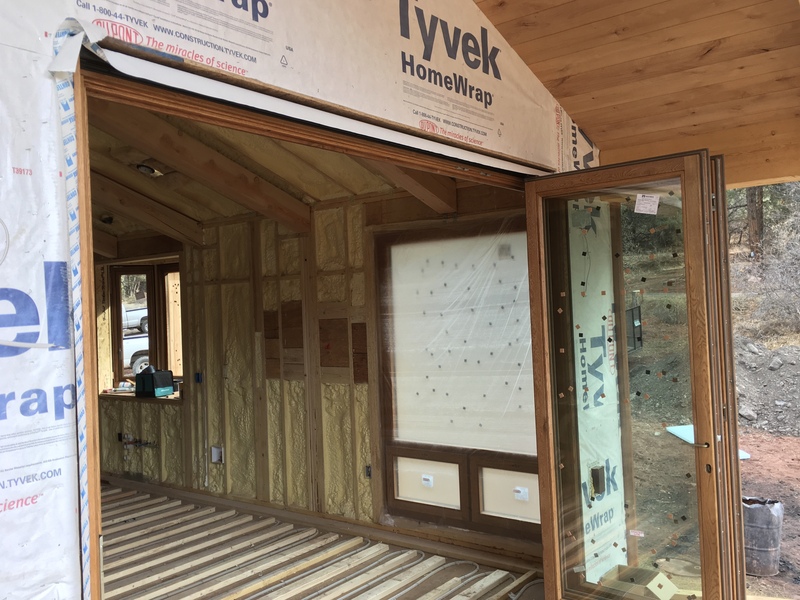 Different companies had their own method of constructing these but they all said thick veneer is not recommended if the door gets much sun or weather. 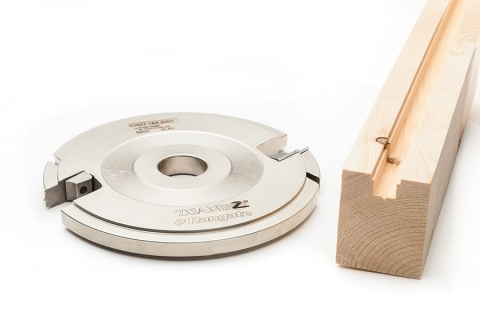 The 68 mm thick cores we make for entry doors are usually so straight it is hard to determine crown. These are usually 5 to 6” wide and that helps. Narrow stiles 4” or less in width that are typical for folding, sliding and French doors are more prone to a little bow. 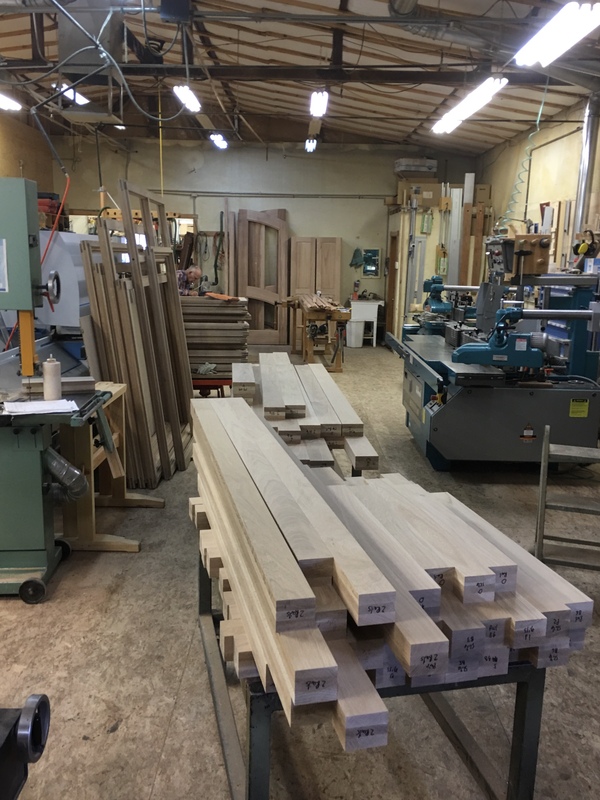 Good wood helps - white oak is good, we are doing a quartered white oak window and door job right now and it is super stable. Plain sawn oak and VG fir also. Some African Mahoganies you have to be careful. 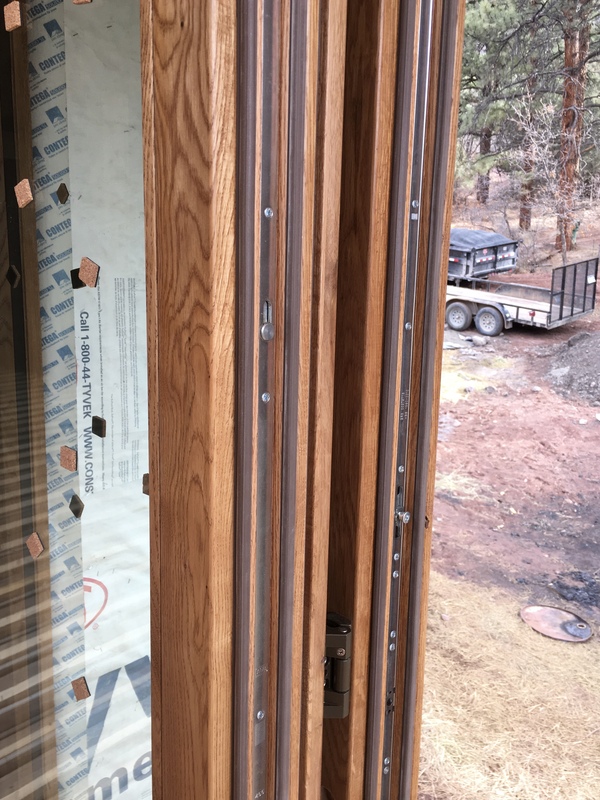 The pictures show typical frame and window scantlings with grain opposed 3 layer construction, rustic white oak with a thicker core made of 6/4 oak ripped and turned. Made this way because the rustic only available in 4/4. And another white oak with a pine core. An effort to keep weight down. Thanks once again Joe. It's curious why they sell those cores with 7 mm veneers if they say they don't do well if exposed to sun and/or weather. I see a lot of slab doors in Germany with all kinds of orientation and exposure on houses. My own experience with 6.4 mm veneers on a composite core has been OK except on wide lower rails where the book matched seam split open in less than a year. Those doors had a lot of direct sun and some also weather exposure, consistent with what you heard at FensterBau with regards to problems. On one of them I replaced the bottom rail with one having 1/8" veneers on a stave core. So far that has been fine, but it's only been 6 months or so. In any case, at this point I'm using stave core but am considering going with the 3 layer system in your photos for this door. Brent, thanks for your post and lead. I am only talking about slab doors with the thick veneer. Those have the composite core with a 3 to 4 mm veneer. 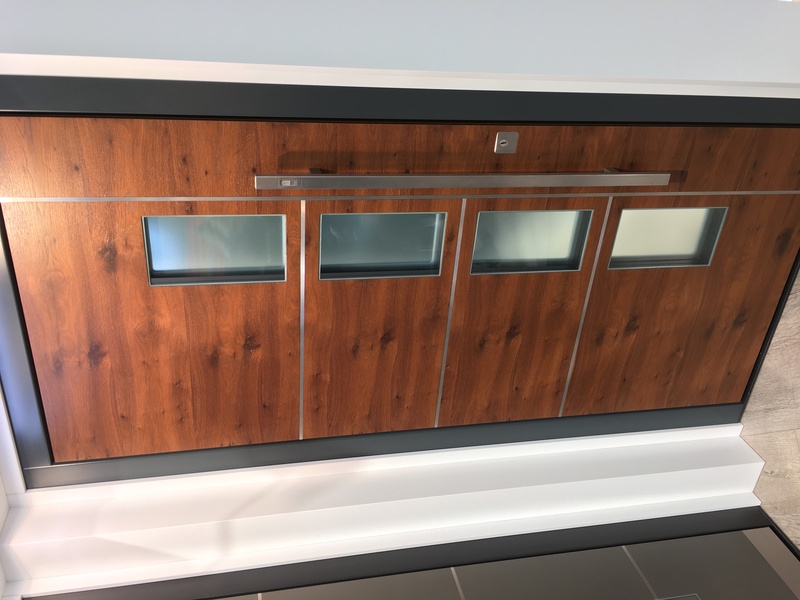 The 7 mm veneer is on stile and rail doors with solid wood cores and no problem there. I have yet to build a slab door with thick veneer but going to try one soon possible using Trycoya for the core. For 2 1/4” you may be better to build the way you have been. Especially if over 7’. You will have to use a thick edging on the outside to allow for the deep rebate.